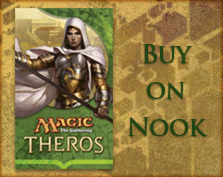 But we want everyone to be able to enjoy Magic's story whether you have time to read a novel or not. So here's the abbreviated storyline of both parts of the novel. Elspeth first comes to Theros as a young girl. She witnesses an epic battle between Heliod and Purphoros and encounters another lost child named Daxos. When Purphoros's sword is swept into the mortal realm, Elspeth retrieves it and flees the plane. Not knowing the sword was forged by a god, Elspeth carries her beloved weapon with her from plane to plane, even learning how to channel her spellcasting through the blade itself. 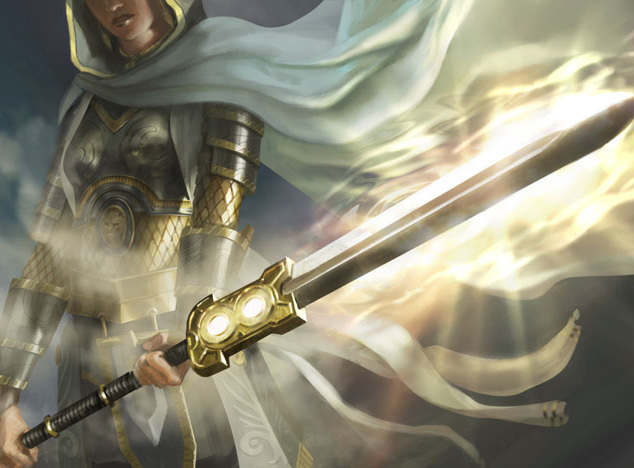 When she returns to Theros a second time, her sword attracts the attention of Heliod. 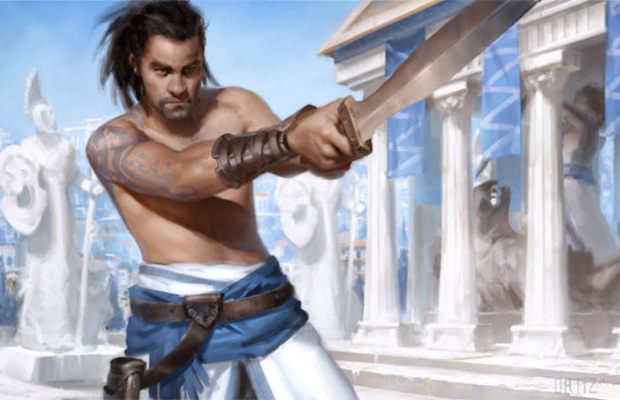 The satyr Planeswalker wants to become a god, and his powerful rituals are disturbing the metaphysical boundaries between Nyx and the mortal realm. Heliod blames Purphoros for the damage to his world, and the two resurrect their ancient hatred against each other. While living in Akros, Elspeth travels to a shrine of Heliod just outside the walls of the city. She prays to Heliod in hopes of understanding Theros's gods better, but Heliod accuses her of stealing the sword. When she withstands his magical assault, he's impressed with her power. He transforms her sword into a spear, which becomes known as Godsend. Heliod challenges Elspeth to travel to Meletis and become his champion. 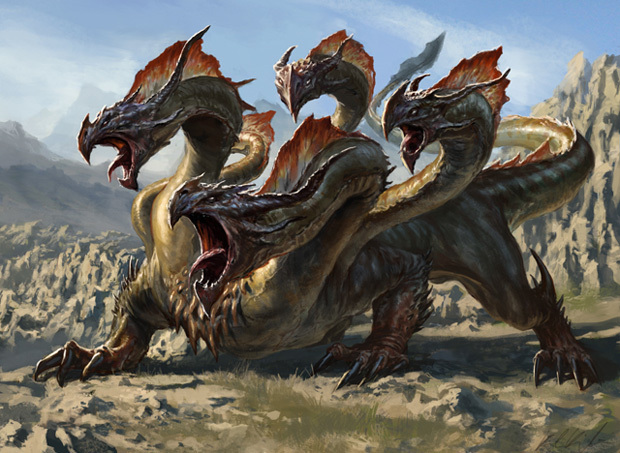 Polukranos, the massive hydra, is awakened and begins rampaging toward Meletis—and Elspeth. The hatred of Heliod and Purphoros reaches a boiling point. 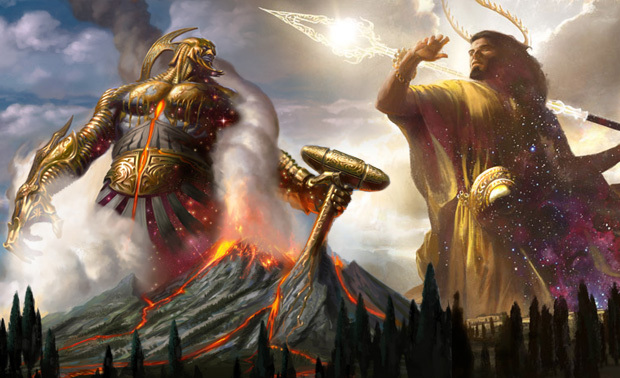 Meletis and much of Theros will be destroyed if they are not stopped. Kruphix is forced to enact the Silence, which draws the gods back to Nyx and leaves the mortals to temporarily fend for themselves. Elspeth and Daxos defeat Polukranos. 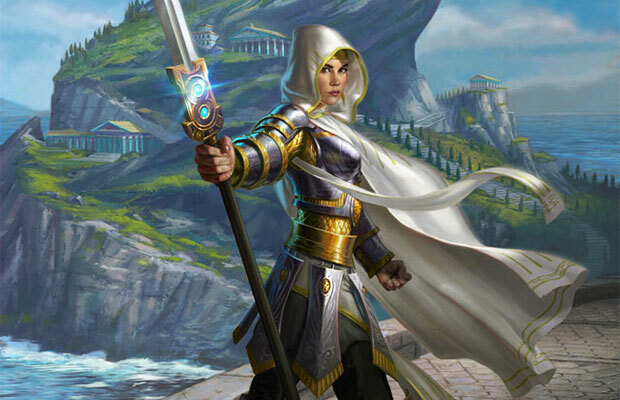 Elspeth becomes Champion of the Sun and earns renown throughout Theros. Elspeth goes to live in Heliod's temple compound in Meletis. Daxos, an oracle of Heliod, becomes her friend and mentor. Elspeth loves Meletis and believes she's found a place she can truly call home. 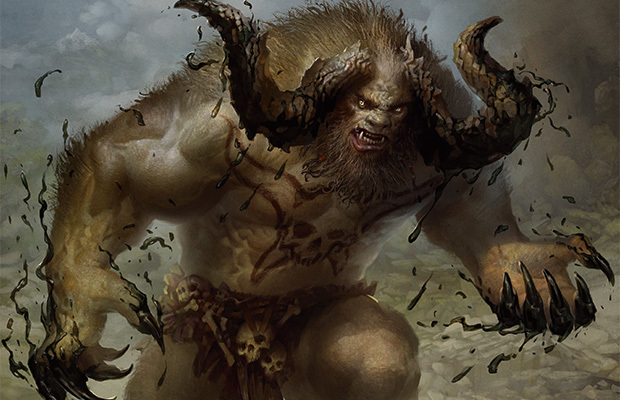 During the Silence, Xenagos manipulates Mogis's minotaurs into attacking Akros. The minotaurs have always wanted to destroy the polis, so it doesn't take much for the satyr to convince them to attack. Hordes of both mortal and Nyxborn minotaurs besiege Akros. Soldiers from Setessa and Meletis (including Elspeth and Daxos) come to the polis's aid. The combined forces of Setessa and Meletis are victorious, and as Xenagos had hoped, they hold a great victory celebration. 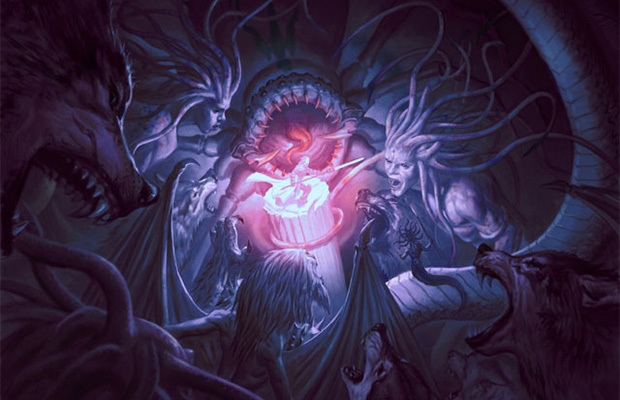 Xenagos transforms this celebration into the Great Revel, a violent bacchanalia. Jealous of Elspeth's blade and hero status, Xenagos wants to destroy her. Using magic, he manipulates her into killing Daxos on the night of the Great Revel. 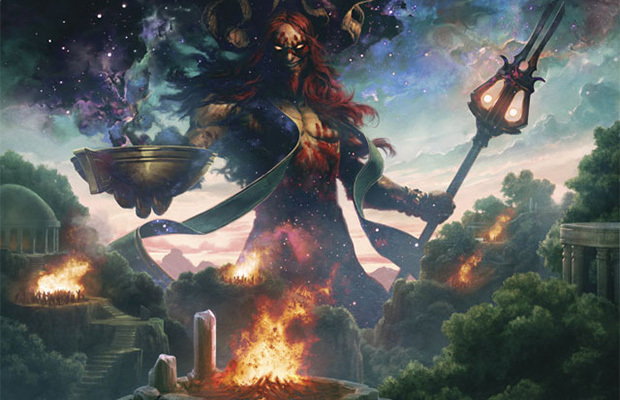 Xenagos completes his ritual and becomes a god. The pantheon is horrified by this change of events and blames the mortals for disturbing the natural state of the world. The conflict between the Nyxborn and mortals escalates. Heliod blames Elspeth for Xenagos's ascension, and she is forced to flee into the wilderness to escape his wrath. Instead of leaving the plane, she vows to stay until she avenges Daxos's death and destroys Xenagos. Her friend, Ajani, finds her in the wilderness and offers to help. 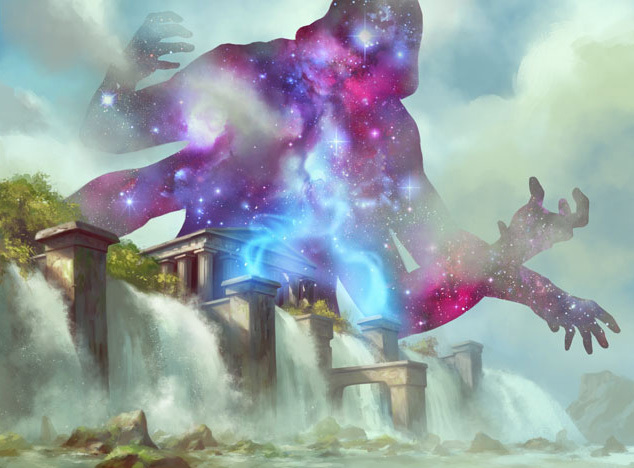 With the help of a mysterious merfolk who turns out to be Kiora, Ajani and Elspeth make their way across the sea to Kruphix's temple at the waterfall at the edge of the world. 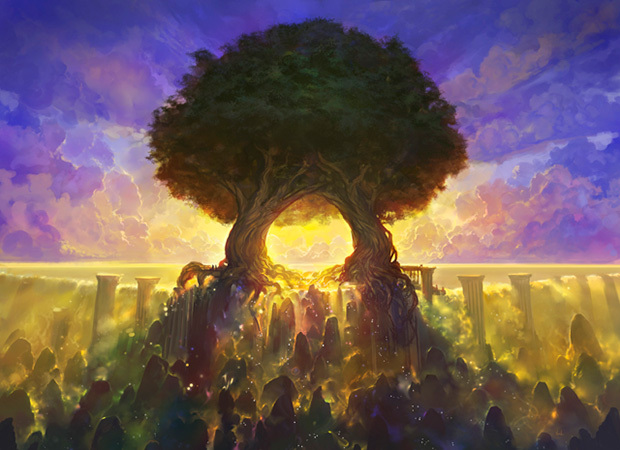 Kruphix is himself a portal into Nyx, and Ajani and Elspeth make it to the "gates" of the realm of the gods. 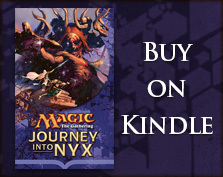 To gain access to Nyx, Elspeth must choose an ordeal from one of the gods. She chooses Erebos, and he tempts her with a vision of a peaceful home and loving family. She can have eternal peace—if only she gives up the fight against Xenagos and stops trying to save Theros. Realizing there is more at stake than her personal comfort, Elspeth refuses to lay down her sword and resign herself to Erebos's trick. Once inside Nyx, they discover that Xenagos has trapped the celestial creatures in fiery torment. 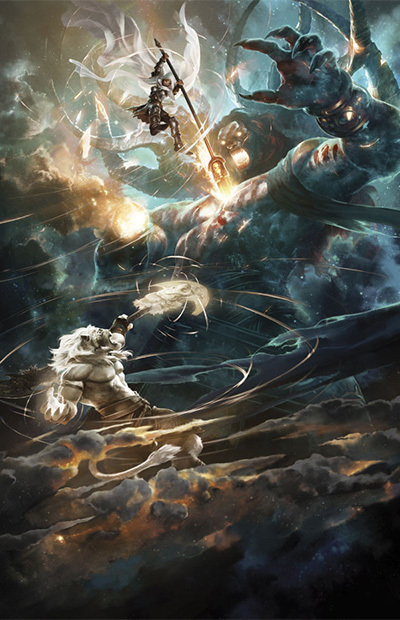 As Ajani and Elspeth work to free them, the God of Revels launches his assault. Elspeth struggles to kill Xenagos until she pinpoints the last vestige of the satyr's mortality and strikes him down with her god-forged weapon. The God of Revels is no more, and the pantheon is restored to its natural state. 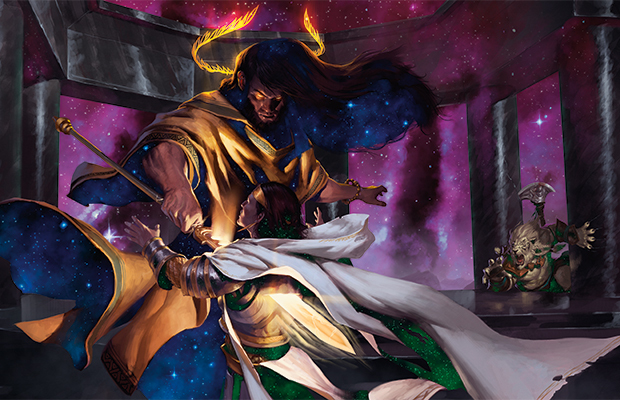 The death of Xenagos doesn't lessen Heliod's animosity toward Elspeth, and he fears her power as a Planeswalker. 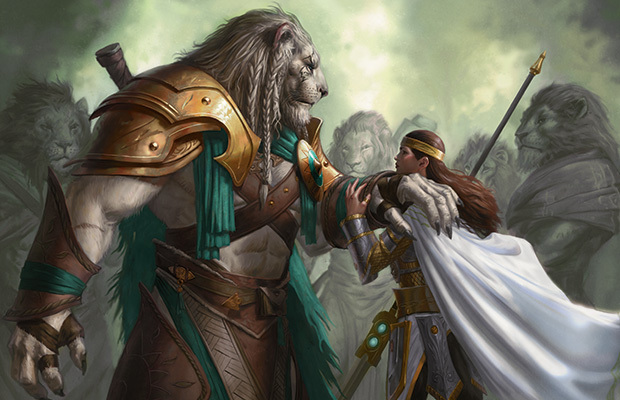 Weak and injured, Elspeth and Ajani try to flee Nyx. But the God of the Sun waylays his former champion and strikes Elspeth with her own sword. 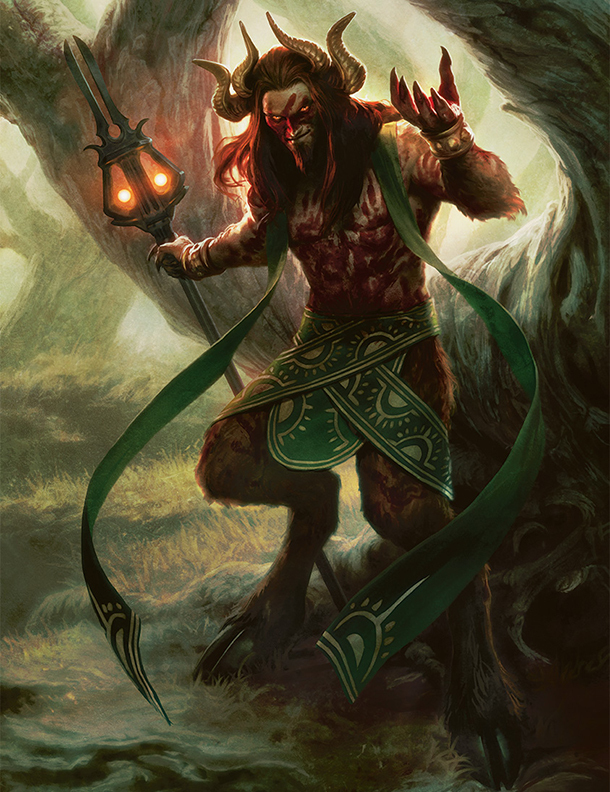 He orders Ajani to carry her back into the mortal realm where she can be claimed by Erebos, God of the Dead. Ajani is spirited away by King Brimaz's leonin, leaving a mortally wounded Elspeth to die alone near the Temple of the Gods. During her hero's journey, Elspeth transcended her everyday fears. Her own comfort and safety were no longer her primary concerns. She sacrificed herself for the love of Daxos, the love of Theros, and the love of innocents who can't protect themselves. 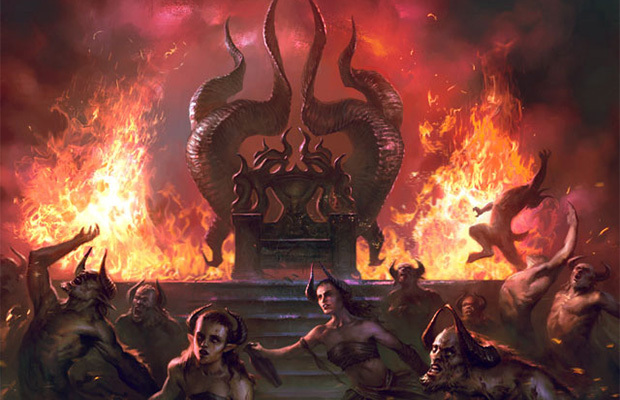 When mortals die in Theros, they go to the Underworld. The living can only speculate what the Underworld is really like, because the Returned reveal nothing. If there are more obstacles waiting for Elspeth, she will face them unhindered by mundane cares and concerns, more powerful than ever before.